Thank you for joining me as we count down to the MFT release. We are four days away from the big day! All the new Stamps and Die-namics will be available on Tuesday, September 5 at 9:00 pm EDT. Be sure to check out the MFT Blog to see all the new items being revealed today. Don't forget to leave a comment on the MFT Blog countdown posts, YOU could win one of the five $75.00 gift vouchers. 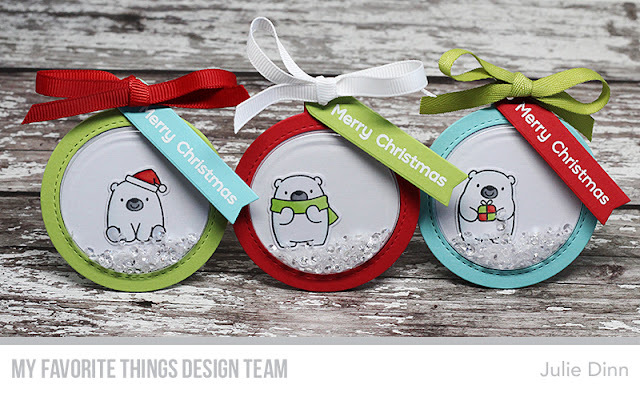 I have a trio of shaker tags to share with you today, I created them with the adorable new Bitty Bears Stamp Set and Die-namics. I paired three of the bears in this fabulous set with the Tag Builder Blueprints 6 Die-namics and the Circle Shaker Pouches. I also used one of my favourite Christmas colour combinations, Red Hot, Sour Apple, and Summer Splash. These tags are fairly simple, but they will definitely add the right amount of bling to a gift under the tree this holiday season. You show how perfect the bitty bears are for tags! Awesome shaker tags!Very creative!Thank you for the inspiration! Oh my gosh !! Your tags are too cute. I could eat them ! Okay - those tags are going to be on the Christmas gifts I'm giving this year! Wow what great christmas shaker tags, love your creativity! I AM IN LOVE WITH THESE BEARS AND WHAT AMAZING TAGS! I LOVE IT!